An Anchorage assemblyman has introduced an ordinance requiring that residents register their bikes on a free online database or face fines. The proposed ordinance by Assemblyman Christopher Constant would fight bike theft and "chop shops" where stolen bikes are disguised, he said. The executive director of Bike Anchorage, a bicycle advocacy group, said he supports the idea. But a manager at a bike shop where high-end bikes were stolen in June said he's skeptical it will work, and doesn't like the stiff fine retailers could face if they err. "That's a no-go," said Spencer Mitchell, a manager at Speedway Cycles. The ordinance seeks to compel registration by proposing fines, up to $25 for individuals and up to $500 for bike shops, if bikes aren't registered. As Constant envisions it, bike owners or shops selling bikes would take a photo of the existing serial numbers on the underside of each bike. They'd submit the photo and owner information to an online registry recognized by the Anchorage Police Department. Some details remain to be worked out, like how people who don't have internet-connected phones would comply. The program is not expected to cost the city anything, said Constant, Assembly member for the downtown area. The municipality would partner with an online effort such as 529 Garage, a free bike registry, he said. 529 Garage, led by Xbox co-founder J Allard, has teamed with more than 400 law enforcement agencies, universities, bike clubs and bike shops to fight the "epidemic" of bike theft, its website says. Under the proposed Anchorage law, people who deface or remove serial numbers, or possess a bike with the serial number removed, would face misdemeanors that bring the threat of hefty fines and even jail time. The identification numbers would give police a better chance to return stolen bikes to their owners, Constant said. Currently about 2 percent of stolen bikes are returned, he said. The measure stems directly from community outrage over petty crime that appears to be rampant near the city's greenbelts, Constant said. People walking through the woods can find mounds of household items near homeless camps: tools, gas cans, grills, car batteries, propane tanks. 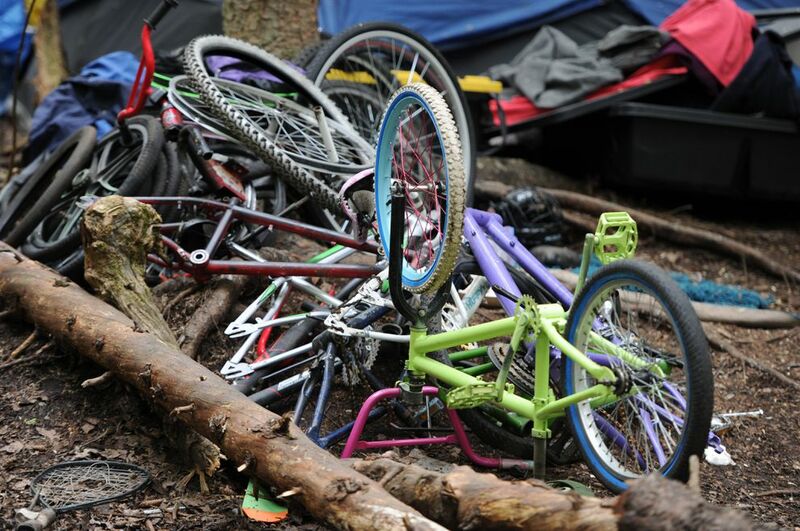 Some encampments feature piles of bikes, often in different stages of assembly. They appear to be stolen, but police have difficulty doing anything about it, Constant said. "We need to get bikes registered so APD can have an evidentiary trail to prove these bikes are being stolen," Constant said. Pierce Schwalb, executive director of Bike Anchorage, said the police department and mayor's office are concerned about the challenges of getting stolen bikes returned to their owners. Schwalb said he supports the proposed fines. That's his personal opinion, not the group's, which hasn't had a chance to consider the proposal. "Whatever it takes to get people to register is important," he said. "We don't want to force this on Alaskans, but I believe it's a good solution to try to reunite Alaskans with a lot of these bikes." Mitchell, with Speedway Cycles, said he doesn't see the mandated registration going over well in Anchorage. He said good bike retailers like Speedway already enter bike identification numbers into a database at the time of sale. Any customer whose bike is stolen can call the store to get the serial number. Bike registration efforts haven't worked in other cities, such as New Orleans, he said. He's skeptical it would deter thefts in Anchorage. "If it prevents theft in a year, I'd be on board like you can't believe," he said. "But if thefts still happen, I'll have a big ol' I 'told you so.' "
Constant said police will have a chance to provide feedback. The idea is designed to create an efficient way for police to combat the thefts. The proposal, on the Oct. 23 assembly agenda, would expire in three years. If it doesn't work, it goes away, Constant said.